By mounting the AVO Power filter in the inner fender guard, you can be sure of getting cold air to your engine! 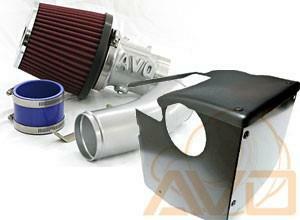 AVO uses a washable and fully re-usable hi-flow bolt-on filter system that includes the mounting adapter and bracket. It is truly simple to install on your own and is a good, cheap power-adder that works well with stock or modified setups. If you are seeking maximum power, this is the way to flow. The airbox is designed to work in conjunction with the pod filter and a modified stock induction air scoop or alternatively our Fibreglass Air Induction air scoop. A simple modification to the stock induction scoop by cutting a hole in it will allow the air to travel directly from the front of the car into the pod filter.